While the efficacy of Listerine as a horse fly spray is more anecdotal than proven, it may be effective on dandruff and itchiness in his tail. The original amber-colored Listerine formula was originally marketed as a dandruff solution but ran afoul of federal guidelines on that claim. Any home remedy is not without risk, however; consult your equine veterinarian before using Listerine on your horse for any purpose. Mix equal parts of the amber-colored Listerine and baby oil in a squeezable bottle. A generic antiseptic mouthwash formula will work if it has ingredients including eucalyptol, menthol, thymol and methyl salicylate. Since it's antiseptic, test for irritation by applying the solution to a small area of skin. 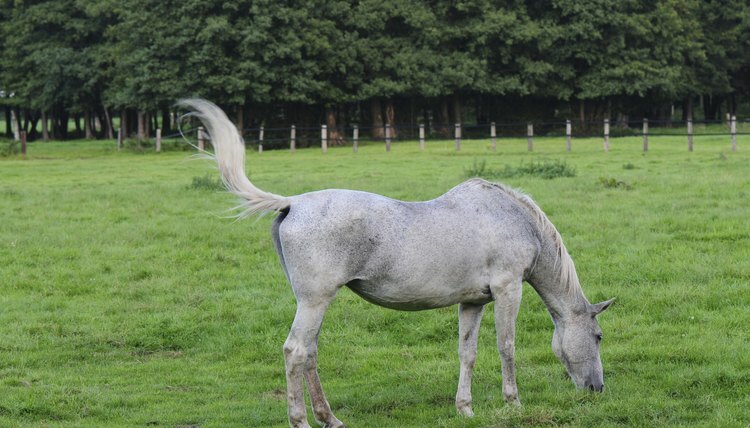 Rub the solution into your horse’s tail dock -- the head of his tail -- deep into the hair roots. Ideally it will kill any embedded microscopic critters that cause dandruff and other itchy conditions. Avoid applying around your horse's eyes and contact your veterinarian if you note any negative side effects. With your veterinarian's approval, add 1 part water to 2 or 3 parts of a household pine cleaner such as PineSol. Add a few drops of tea tree oil. You can also include a few drops of eucalyptus, pennyroyal or citronella oil -- use only the plant-based citronella essential oil, not the type for outdoor torches. As an alternative with less pine cleaner, combine 1 cup each of vinegar, baby oil and water with a quarter-cup of pine cleaner, then add 1 tablespoon each of mild dish soap and Skin So Soft. Always test these remedies on a small patch of skin before applying broadly and avoid the eyes. Equimed: Do Homemade Equine Fly Sprays Really Work?